In 2016, we created some animations for Fleetmatics, whose vehicle tracking technology is used in hundreds of thousands of commercial vehicles worldwide, explaining different facets of their telematics system and how it can help increase efficiency for anyone who runs a fleet of vehicles. Fast-forward to December 2017, and they got back in touch. They (and two other similar companies) had been bought by US telecoms giant Verizon, and they needed a European brand video for the launch in March 2018: would we be interested, and could we turn it around in time? The parameters were: they needed a 60” brand video in English, French, German, Dutch and Polish (with an additional voiceover in English using an Irish-accented VO artist); it had to cover enough of Europe to resonate with a van driver in Grenoble as much as a trucker in Scotland; and it had to be ready for the brand launch on March 8th, no matter what. Beyond that, we were given pretty much free rein in terms of the storyboard and locations we used. As reference, Verizon showed us a draft edit of a US brand video which they were making. We decided that given the timescales and potentially lengthy approval process, the best decision would be to adapt our script from this pre-existing video. The US version had a line of dialogue which we opted to remove, to avoid having to either reshoot it in five different languages or use dubbing (which always looks and sounds pretty dreadful), and we also reshaped some of the script to make it more “European”, but other than that, we were good to go. 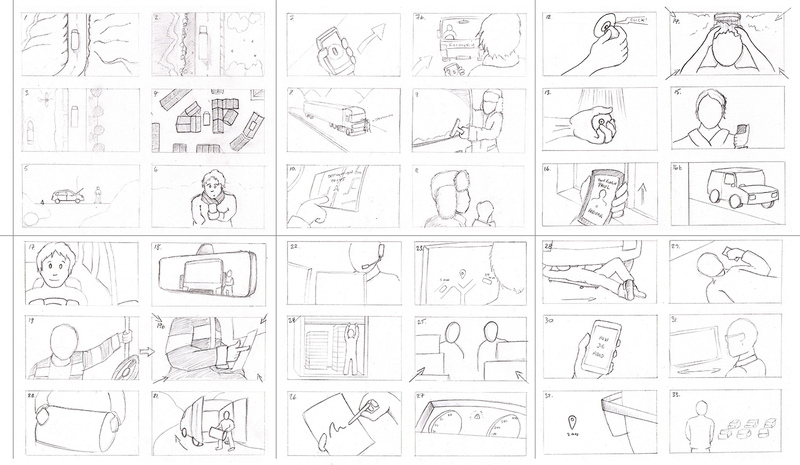 We then created a storyboard detailing every shot we would need to film. This became the reference point throughout the production, and also guided us when we came to the edit. Next, we began looking at locations. As this was a pretty open-ended brief with a hard deadline, there wasn’t time to physically scout locations that might have turned out to be unsuitable, so we relied a lot on Google Street View for initial research. Once we’d narrowed the options down to a workable list, we brought in location fixers NeedAFixer, who were able to give us additional information about some of the locations we’d found, and advise on filming permits, availability of local services and so on. Around half of the crew on this project came from our in-house team. Leading the ground unit was Neil (Director) and Sherice (Assistant Director), while Nick was back at the studio overseeing production duties with the rest of the in-house team. Cinematography duties were undertaken by talented DOP Adam Hobbs, who was joined by Camera Assistant James Spencer for the duration. Using the ARRI Amira, we shot everything in 4K UHD (3840×2160) and in log mode so we would have maximum control over the look and colour of the finished film. We also had an FS7 (our regular weapon of choice) on our Movi Pro rig and a Panasonic Lumix GH4 on a car mount, and the whole thing was shot on Canon CN.E prime lenses. All the kit (about 150 kilos in total) was transported around Europe by Adam in his shiny crew van, which was an amazing help as it saved a load of unnecessary costs on excess baggage. Two of our regular collaborators, Si Gennard and Nick Payne, handled ambient audio recording and photography, respectively; Nick couldn’t make the Portugal shoot, so we were joined by ace photographer (and ex-Def Leppard drummer!) Frank Noon. Filming in Switzerland. It rained. Back at base, our Production Manager Lou was in charge of production logistics and making sure our team were where they should be, at the right time. And finally, the graphics team, Aidan and Kris, created screen replacements to represent the product in use on various electronic devices (and in all five languages), and the CGI vehicles that feature in some of the drone shots at the beginning and end of the film. The drone work in England and Portugal was carried out by our regular collaborators Surface2Air Media, and Kiwi Aerials in the Netherlands. In total, we spent 16 days either shooting or travelling on this project, including around 16,250 air miles (3585 actual miles with either 4 or 5 crew), 3009 miles covered in Adam’s crew van, and one 255-mile train journey between Zurich and Frankfurt. We took one of our mobile edit suites with us on the shoot, which meant that we were able to assemble our draft edit piece by piece at the end of each shoot day. This meant that by the time we returned to the UK, we had already completed our rough cut, allowing our graphics team to get to work on the screen replacements and CGI vehicles. One of the CGI vehicles we used – rendered in Cinema 4D with Octane. Once the CGI elements were complete, we could colour grade our project in Da Vinci Resolve and output the final piece. For the non-English versions, VO artists and script translations were provided by Matinée Multilingual, with Nick directing VO sessions via Skype across various time zones.